This actually falls perfectly in line with something I already had planned as I had this strange feeling K2 was not on the app store / android or ios and I had similar thoughts about porting one game to the better engine be it K1 or K2 and the files are pretty much ready for release, the K2 to K1 map pack will be my first release and should be available within the next few days, as I didn't originally have much planned for them, but I did think about porting the entire game to the better engine and or vice-versa as well as porting K2 to K1 mobile. Could be a great project to start, though it wouldn't surprise me if Obsidian popped up, took it and started selling K2 on the app store, but I guess that would be a good thing in a way. I am pretty sure all the scripts should also work fine, if not most of them, for example the Onderon Turret and Peragus Turret mini-games are currently working in K1. Do not port the entire game from one engine to the other. They will notice, and they will shut you down, and they could shut down Deadlystream.com. Do you remember Aperion? They too wanted to port the game of k1 into a different engine. Deadlystream has allowed ported between games, but that does not mean it allows the entire game to be transfered from one to the other. What is the official word on this mods/admins? The previous message from this post. Understood, though the reason for Aperion was because it was a COMPLETE remake of the original game, which meant if they ever planned to remake it themselves they could not, though it is definitely good to think about it in this sense, the thought already popped to mind, but no reason I couldn't just host it on ModDB or my own site when I finally make one.. Given how this could prevent them releasing K2 for mobile, now I think about it the same kind of cease and desist order could be applicable. Note : Perhaps this could actually be worth contacting Bioware & Obsidian to ask about ( as well as presumably Disney now > _ < ) I mean even if they were to take the work and release it officially I don't think I would mind. Just don't talk about those plans here again, and keep on doing what you are doing. Edit your OP to not say that, and edit your funny and good post to keep it all good. This is unfortunately your best course of action. Increasingly the internet is composed of busybodies, crybabies and tattletales that will try to control you any way they can to satisfy strange needs. Ignore them as much as you can. Edit: DO NOT CONTACT THE MAKERS, ARE YOU MAD? Is it ok if we just work on this for personal use only, eventually release only a tutorial here so that anyone with basic computer skills could create their own K2M Port? Yes, and you can do that and get help here without talking about that part of what you are doing. Pro-tip - you will fail miserably trying to port the games in one direction, and have success the other. I will not explain. All of my previous post moved below. Just don't talk about those plans here again, a﻿nd keep on doing what you are doing. Edit your OP to not say that, and edit your funny and good post to keep it﻿ all good. This is unfortunately yo﻿ur best course of ac﻿tion. Increasingly the internet is composed of busybodies, crybabies and tattletales that will try to control you any way they ﻿can to satisfy strange needs. Ignore them as much as you can. Edit: DO NOT CONTACT THE MAKERS, ARE ﻿YOU MAD? I will leave this message to correct things as I will make my intentions clear that I will not pursue this immediately simply because it could prevent an official K2 mobile release. As for contacting the makers, maybe a bad idea but who knows, TSLRCM & M4-78EP got a lot of publicity and seemed well received by Obsidian. A better idea would be to continue making a mod for both games and hope to get enough publicity to raise the issue. I may or may not pursue this, I will be focusing on my mod for the moment unfortunately, but there is always the future. The reason they could actually pursue a cease and desist would be a legitimate reason that I understand and agree with. It would stop Obsidian being able to release K2 mobile one day. But I am fully on-board with trying to make it official and hoping for enough recognition after making a decent enough mod with K1 & K2 maps. Unfortunately the legal implications may actually prevent me releasing the modders resources at all... ( I hope not, though I will definitely not be releasing the K2 to K1 maps until every single one works ) as for the K2 to K1 idea it is still my idea to pursue this, but it will require users to own a copy of both games in order to copy certain files from K1 to K2 and it's main focus will be an ease-of-access mod allowing users to have a singular 6+ GB Installation as opposed to two 4+ GB Installations. But this will also be the focus of my efforts long after a storyline focused mod meant to add the planets to both games which was my initial intention / the original reason I started working on all of this as well as having decent copies of all of the maps for an older project I was working on to re-use the original KotOR maps. I know it would only work this way as I am already struggling to port the maps to the first game and being built by Bioware is a stronger and safer system, too much editing of the files causes it to crash from what I have seen so far, it also has memory references to the sizes of some files, where as K2 by Obsidian is somewhat jerry rigged on top of the first game to work ( from what I have seen of the games file structure and build ). Maybe you think differently though? Thank you for suggestions and thoughts about everything, as previously mentioned I will not pursue a K2 to K1 mobile port without either an official go-ahead ( preferably after what I think could be years worth of work and recognition from Obsidian, depending on how in depth I go about it ) though I do have small-scale plans for basic re-introductions of every planet towards the end of the game and a new basic galaxy crawl for every planet and a main questline for it and then my thoughts were to request user made quests & side quests to place around the galaxy and to accept ideas / suggestions, maybe even vote for what quests to include in the end. Additional : I will still back up both versions at some point as a "modders resource" but may or may not release them due to concerns raised. Thank you for suggestions and thoughts about everything, as previously mentioned I will not pursue a K2 to K1 mobile port without either an official go-ahead .... though I do have small-scale plans for basic re-introductions of every planet towards the end of the game and a new basic galaxy crawl for every planet and a main questline for it and then my thoughts were to request user made quests & side quests to place around the galaxy and to accept ideas / suggestions, maybe even vote for what quests to include in the end. Do you mean Kotor 2? in contrast to K1 the planets feel a lot too short although storywise TSLRCM does excellent to make up for it. However, the missing areas from K1 Dantooine, Korriban ported to K2 and filled with quests would surely help. Speaking of some bonus quests - what about porting some SWTOR questline voiceovers & recreating them in K2 to expand/flesh out the game further? Previous messages about porting SWTOR Textures, Models, Voices & information regarding the Odyssey & Aurora engines. As for voice-overs I didn't really think about that, sounds, combat shouts and vocals others have mentioned and made mods for around the site, but I didn't think of it at first, this is a great idea! if it would be possible to find the necessary pieces to create some basic quests not too reminiscent of SWTOR. There is a lot of Audio to go through and still some of SWTOR I have not played, so there is a lot to look into. The new planet I had planned ( Hoth ) has already been scrapped unfortunately due to my poor memory and it not being applicable to the story element I was going to use it for. Question : What does everybody think about a complete port of KotOR over to TSL for an Ease-of-access focused mod intent to save space for users and make both games more easily accessible and built into a single launcher program. It will also combine the placeables, placeable objects, characters, swoop tracks and more allowing for more diversity from future mods by other users. Additional : A few new ideas for the mod such as a CZ-196 or Czerka themed area made out of all the Czerka assets in games, of which there are quite a few, such as the pieces on Kashyyk, Korriban, Telos, Tatooine and some odd pieces that I hope to reconstruct into new maps for the game such as the Sith Base modules which could easily be used to map out some new locations. There is also now a lot of placeable objects, placeables, characters, sounds, music and more from both games which will help make maps made of these pieces feel new and not just a carbon copy of the places they will be made from. This will also help with recreating the maps for another project I have planned for a different Star Wars game. Aurora Engine Research : Upcoming ( I will find out which was the most up to date game released before Bioware was handed the Aurora / Infinity Engine ) as well as look into any changes made by Obsidian ( if any other than strapping it on top of the first game ) and see if I can add any new features, effects, elements, assets and more. If anybody has any suggestions or relevant knowledge about the Aurora Engine please let me know, I have read around and looked into this before, the general consensus is that it cannot be done, but I believe otherwise, just that it may not be as easy as one would hope, my initial thoughts were to debug two copies of the game running at once using modified "swplayer.ini" files, but before doing so also debugging to check if the [Server Options] code is even executed at any point throughout the operation, personally I believe it will be executed when the player clicks new game and is finished creating a character, the potential for a new launcher and a "Join Game & Host Game" instead of "New Game & Load Game" stands out to me if this is the case. I will be buying the following games as NWN1 is 2002 / 2003 and NWN2 is 2006 so inbetween this the Aurora Engine was handed to Bioware, though from what I know it is heavily modified. to access a lobby of games or connect to a specific address. but a lobby would of course be best. in half to remove the online element, in hopes of re-introducing the aspect. this would allow multiple players to play the story or assist each other with quests. I would really like to know what everybody thinks about both of these ideas as well as anything else I have mentioned. A new Adventure Pack for Atari's Neverwinter Nights 2. Storm of Zehir is an expansion for Neverwinter Nights 2. It adds full customization for a party of 4 and a free roaming overland map. The Witcher is an Action Role Playing Game developed by CD Projekt RED and is based on the book "The Last Wish" by Polish author Andrzej Sapkowski. An Enhanced Edition was released in September, 2008. A director's cut version was released for North America on July 31, 2009. The silver shard of Gith is gone from your chest, replaced with a mysterious hunger for souls. You find out what happpened and discover a cure before the hunger consumes your very soul. The sequel to Bioware's Dungeons and Dragons PC role playing game of 2002, Neverwinter Nights 2 puts the player in the role of a peasant that must realize his importance in the world through an epic adventure. Hordes of the Underdark is the second and final expansion to Neverwinter Nights, which continues the story of Shadows of Undrentide. It was released in 2003 and adds extra content for high level player, such as the ability to reach level 40 (raised from 20). Shadows of Undrentide is the first expansion to Bioware's Neverwinter Nights, and was released in 2003. It added a new 20 hour adventure, five new prestige classes, weapons, feats, skills, spells and monsters. Bioware's epic RPG lets players choose between a noble paladin, a sly rogue, or a powerful mage on a quest to erradicate a plague that's afflicting Neverwinter and to save the world from a powerful foe that is once again on the rise. Icewind Dale II was the last game to be built on the Infinity Engine. Based on the DnD 3rd Edition ruleset, the game lets you build a party of up to six characters who make their way through the harsh winter of the Forgotten Realm's Icewind Dale region. You must fight the most powerful spawns of Bhaal that have been plaguing the lands and destroy them for the sake of Tethyr or your own personal gains. Heart of Winter is the official expansion pack to Icewind Dale, featuring new quests, items, spells, and some technical improvements to the game. Take hold of your destiny as you journey across mysterious lands, encounter many magical creatures and meet many memorable characters in a large fantasy world. Though graphically and mechanically similar to Baldur's Gate, Icewind Dale focuses less on story and more on lots of combat. An isometric RPG using Bioware's Infinity Engine, Planescape: Torment is set in the Planescape universe and tells the dark and provocative tale of The Nameless One, an immortal searching for his identity. Tales of the Sword Coast is the official expansion pack to Baldur's Gate. It includes several new quests, enemies, and spells. Thanks for the ping, @jc2. From a rules standpoint we have absolutely nothing against a full-game port. Porting some content from one game to another is quite different from porting all content, but again from the standpoint of the restructured rules there is nothing which prevents such a project from being undertaken, discussed, and uploaded here on Deadlystream. With that said, that is different from an attempt at cross-platform porting (IE making a hypothetical KOTOR 2 for mobile), which we did not think to address at the time that we restructured the rules. Frankly I have my doubts about how feasible such a concept would be anyway, but until @Tyvokka and the rest of the staff can weigh in I would offer an initial assessment that we would be against that--no discussion of it, no condoning of it, certainly no uploading of it. While a hypothetical KOTOR-to-KOTOR 2 port could (and probably would) need some form of purchase validation for both titles in order for us to feel comfortable with it being hosted here, a KOTOR 2 made mobile-compatible would be a direct cut into the market for the game, which would quite likely damage sales and increase the chances of ire being drawn over the issue. Keep in mind that this is my initial, singular opinion and assessment of the issue based on the wording of the rules, which as I noted don't fully account for this particular circumstance. When other staff have weighed in, the final consensus may be quite different. 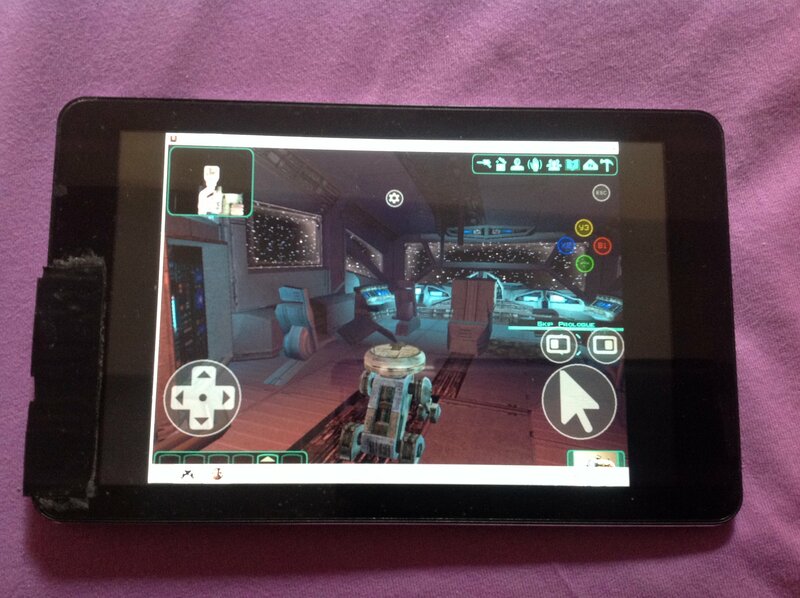 Kotor 2 on mobile already sort of exists... You can just run K2 on a Windows Tablet / Phone with a virtual Joystick emulator and that is about it! Also, EA / Obisidan never actually did port K1 to IOS and Android...they simply comissioned a third party company called Aspyr media to port it, and they did a market study to see if it was worth it to port K2 as well...and ultimately decided not to go ahead with it. The not-so-great part is at the bottom of the announcement, surrounded by those dastardly asterisks. It reads “KOTOR 2 mobile isn’t on the horizon. Yes, we know you were gonna ask. Sorry." So, there would be no market cut in this case since there is no intention to launch a K2 Mobile port in the future, and it is already an almost two decade old game, so every year the chances of it being ported to mobile actually fade more and more! As another example...Beloko games did an unofficial Android port of the Star Wars Jedi Knight shooter games, and there were no legal problems of any kind! The way they adressed the issue was that they just provided an alternate engine for the game that ran on Android, and the user had to own a genuine copy of the game, and copy the .pak files from the PC version into the Android engine in order to play the game! 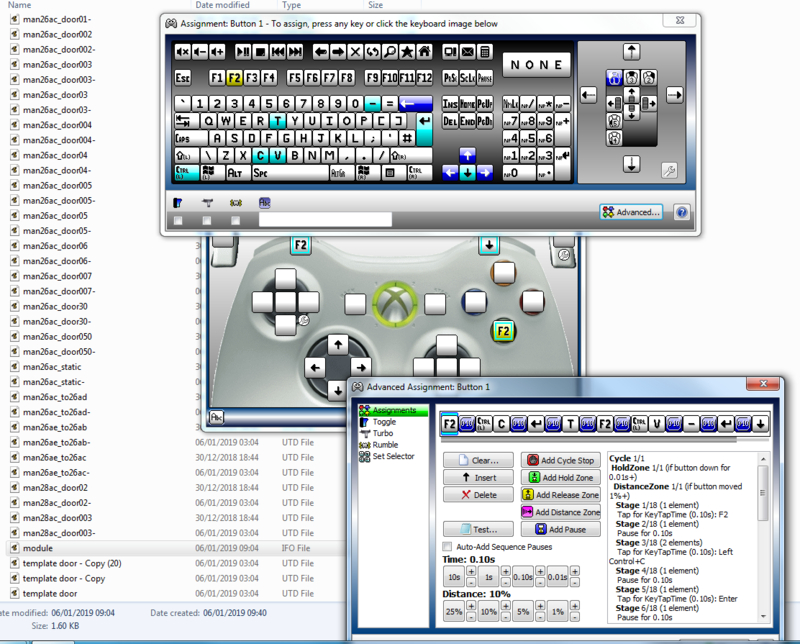 Previous message with my reply and notes about using Xpadder & a 360 controller to do most of the basic editing for me. Also, EA / Obisidan never actually did port K1 to IOS and Android...they simply comissioned a third party company called Aspyr media to port it, and they did a market study to see if it was worth it to port K2 as well...and ultimately decided not to go a﻿head with it. So, there would be no market cu﻿t in this case ﻿since there is﻿ no intention to launch a K2 Mobile port in the future, and it is already an almost two decade old game, so every year the chances of it being ported to mobile actually fade more and more! Nice bit of information there, considering you can run it windows tablet and mac, as well as modded xbox and pc, thats enough platforms to start for sure! We will surely have to wait and see. For the meanwhile here is a small update and a tip on how to use a really good program meant for gaming for modding purposes. Using Xpadder I used a large amount of copies of a template door and renamed them to the same as the current door file name with a "-" at the end so that I could reset all the doors to an easy to open state as well as opening and changing generic type I can then delete the initial file and rename it to remove the "-" as well. I am now able to automate a lot of the processes I would use in everyday modding and programming using my xbox 360 controller, so I can sit back, relax, watch a series, listen to music and make sure I do all the basic editing without the repetitive part. 1. Kotor I and Jade Empire were already ported succesfully, so there is a proven, effective workflow for the porting process that has been already implemented with great results. 2. Kotor II runs on the Aurora Engine (based on nwscript), same as Kotor I and Jade Empire (which were already ported). Kotor II uses a slightly updated version of the engine, while Jade Empire uses an even more updated version of the Aurora Engine and features highly complex combat mechanics, and it was still sucessfully ported to mobile platforms nevertheless! 3. Kotor II has already been ported to Mac OS, and is present in the official Mac OS App Store, and it is a known fact that IOS is a modified version of Mac OS (that shares the same kernel and UNIX core, but is optimised for mobile devices). Considering the facts above, it would look like most work is pretty much already laid out ahead for the developers, at least for porting the game to Apple's IOS. There is also the increase in computing power and storage speed for mobile devices, that happened since Kotor I was ported, so there should be even less limitations and work to be done involving reducing the size of the downloaded and installed files of the game and other tweaks necessary to make the game run smoother, as was the case with Kotor I. On an iPad Pro 2, the game would most definately run and look nothing short of absolutely stunning! 1. 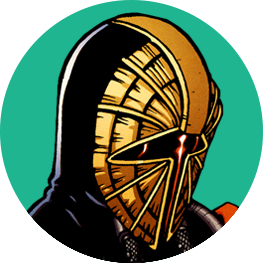 Since Aspyr Media already got the rights to port Kotor I, Kotor II and Jade Empire to the Mas OS and Linux operating systems, and thay got the legal right to publish these 3 games to Steam, and most importantly to the Mac OS App Store, and since they already ported Kotor I and Jade Empire to IOS and Android as well and published the 2 games on both the IOS App Store and Android's Google Store, what is stopping them in porting the app to IOS and releasing it to the Mobile Apple App store as well? Isn't it basically the very same thing as the Mac OS App Store from a legal standpoint? Both the Mac and the Mobile App Store are owned by the same company, have the exact same License Agreement, can be accesed with the same User Account that signed the same EULA, and are basically stored on the same datacenters! 2. Some people stated on the forums that there might be a legal problem preventing Kotor II being ported to mobile, involving the fact that the game was developed by Obsidian instead of Bioware. If that was the case, how come this did not prevent the game to be ported to Linux and Mac OS as well, and how come despite this the game has been legally published to the Apple App Store? The same people also stated that Aspyr officials informed them that Disney / EA did not agree with the porting of the game. Again, the same question arises here, then how / why was the Linux and Mac OS port and the Apple App Store publishing possible, since it involves the very same legal envirnoment? Unfortunately there are often many reasons to things like this, most likely considering how popular K1 is compared to K2 as well as their market research to prove it may not be worth it in the long run when looking at a time / money / profit ratio or from a business perspective. I personally am very interested in pursuing this officially after the bulk of work for my main mod, even if people think it is a crazy idea to contact Obsidian, I personally do not and if there would be a cease and desist order I guess at least this way I could get it before starting work on the idea. But without permission I would not pursue it as I would not want to prevent an official release which could be superior or of similar quality. Update : All doors in K1 have been edited so the player can not only walk through them but open them with no challenge, this is for testing purposes. I still need to add a duplicate peragus door, but this will take five minutes. Nearly on the final step, adding the new galaxy map / planets and backing it up as v0.25 as a completed modders resource to be released when I am finished with it. I also have plans for a few other handy tutorials and modders resources that should make module creation a little easier for anybody new to it or unfamiliar with the filenames they might need to use to populate a map, such as a comprehensive guide to what module pieces are what as well as placeables and placeable objects. I will also be cutting up every module there is in order to make an alternate "modders resource" made of map pieces cut and arrange into tilesets to allow for the creation of new buildings and dungeons for the game with little work, this mod in general should also allow for much more diversity when modding either K1 or K2. Another resource I will be releasing will be a folder with all of the placeable objects and relevant textures for them in a single folder as well as a link to the NWN model viewer, giving users a nice folder / easy way to view all of the placeables / placeable objects in the game, I will also have a map version of this resource and I will release it to save users time extracting the games contents, converting and arranging things in such a way could take hours for some people. Really looking forward to constructing new maps, given all the pieces available in both games it should allow for an awesome amount of content to be made by me and other users after release, I will also be re-constructing all of the maps in one file ( per module ) rather than in pieces per map for an alternate project. Hoping to turn this into a comprehensive mod that combines both games and adds all the necessary content for both as well as easy mod compatibility with both games and vice versa, also removing .6GB of files that are contained in both games. Please let me know what you all think about the ideas in general, any specific ideas amongst the bundle of plans I have talked about, many of which may be abandoned in the long run if they prove to be an un-manageable workload. Sounds like a very ambitious project, good luck with your endevour! *For anyone who makes this confusion: Apeiron was not a port! It was a remake, meaning it was K1 remade from scratch in another engine (in this case Unreal Engine 4). The only content "ported" (though more likely copied or imported is the proper term here) was the soundfiles and dialogue files, which it used instead of recording new VO's and writing new dialogues, and this was also used as some form of DRM, to prove that the user owned a genuine copy of K1 and to prevent piracy! Apeiron has not been shut down for mass porting, because it didn't port any modules / characters / skins / models / textures, they built them from scratch using the original game as reference! They were C&D-ed because of "plagiarism", that is because they recreated new models, characters, maps and props and basically a whole game copying K1, and launching it as a brand new "remake" game! In Disney's opinion, this was an unfair use of their Intellectual Property and they said that Apeiron would be confused with the original K1. It's like if someone decided to make a blockbuster movie with a remake of "Star Wars VIII - The Last Jedi" with new identical or similar props, actors, costumes, locations and story, while ripping the actor's dialogue lines from a copy of the genuine film. I will update my tutorial at some point but unfortunately if you want to automate the process I would prefer people took the suggestions I gave and worked out how to do it themselves, I simply used Bulk Rename Utility, Xpadder and an Xbox 360 Controller as well as MDLEdit for Batch Conversion of the models and maps, as mentioned in heavy detail in my tutorial, the thing you may be forgetting to do is to convert to ASCII in K1 or K2 mode dependant on the map and game you are porting from and then set it back to K1 or K2 mode for the Binary conversion again relevant to the game you are porting the map to. As mentioned in my topic some maps do not port properly, I even explain the steps I took to get them working. I do plan on writing more tutorials, but not until I know each area that I will be writing about well enough. Though a little rushed, I followed my own tutorial several times, though this doesn't prove it's easy to follow. You are best off sticking to doing a single module at a time until you get a good feel for exactly what files you need. As previously mentioned I do still hope to release as a modders resource, but people will have to be patient and give me a few weeks or more to get a good start on my main project, as mentioned with the K2 to K1 maps, there was too many problems with foliage and I could not resolve this issue during the conversion, I also had to convert it "planet by planet" instead of all at once so that I could note down which pieces failed to convert properly and to save me ending the MDLEdit process all the time through task manager. Currently preparing the modders resource folders containing mdl, mdx and .wok files for all placeable objects, maps and doors as well as all the textures for each model, the NWN model viewer is really handy for these packs I will release allowing users to easily flick through content that can be used in module creation, Placeables especially. I'm well-aware of the situation regarding the K1 mobile release, and I made my statement with that in mind. A market cut would be the likely result of such an act because the "free" mobile version would be more accessible to many, and thus the paid PC version would drop sales as people figured out ways to just use the mobile port alone. No purchase validation is flawless, and platform-to-platform just makes it easier to spoof and much, much more visible when it happens. There may be ways to mitigate the risk, but from a legal perspective it's not something I think Ty will want to mess with. I'm not the one who will make that call, though. Old message about using the NWN Model Viewer to easily view models from the game. NWN Model Viewer Assets ( Old Release, New Release on ModDB ) I will write a tutorial to go along side the files but basically you need to extract the models.bif from the game using Kotor Tool and then combine them with the resource I have provided on ModDB which is intended for my module re-skinning tutorial, combining your extracted files with these will allow you to easily flick through all of the models in the game to pick for using. This is a small release of files that will make it easier for people to make modules, it will also help me pick out objects to use to make the galaxy look and feel a little different and to prevent any duplicated modules looking too similar, the idea was suggested to me in a Private Message as they thought I had made the NWN Model Viewer and asked about an easy way to flick through all of the placeable objects in the game, I decided doors were also a good shout and I will also do the same for the maps to make it easy to pick which pieces of which modules people might want to use in creating a new map. and I will soon release the maps in original form with the relevant textures too, this is to allow for easier viewing of the placeable objects and doors, as well as maps and models in general in the game, also making it easier to document and record exactly what placeable objects are what, maybe in a .doc somewhat similar to how people have many guides to what movie files are in the game and cut-scene modules etc. Archived message about NWN Model Viewer. I like the idea of porting the modules between the games for further expansion. I would agree with what has been said, porting the entire story between either game would not be allowed with out specific permission from the publishers/developers/Disney. With that said, I am against blocking of all discussion on the matter, as I think that even if it is only for educational and research purposes it is a great subject to discuss and collaborate on. That is good news Tyvokka, we thank You and the Admins / Moderators for clearing this out! Acknowledged, full game ports will be attempted ONLY for personal / research use, with NO releases or uploads of any kind! It would be cool if someone would make a K2 port in private and only send Disney / EA / Obsidian the only copy of the project (and then destroying all his / her copies), and write them: "Dear Disney / EA / Obsidian, since You had no interest in making a mobile K2, here you are, I made all the work for You! Now, if You please, would You kindly consider officially publishing the app to IOS and Android? 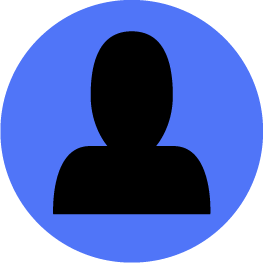 You are now in possesion of the only copy of the build, I deleted my files and never aimed to publish anything since only You have this right and it is Your property, now it is only up to You to publish the game!" and sending the letter to the gaming press as well :D I'm really curious what their reaction would be! Thor110, i am making progress using Your tutorial...actually the module porting procedure was not so complicatede after all, after i managed to wrap my head around it i managed to port the Ebon Hawk, Peragus and Harbringer from K2 to K1 in less than 2 hours (i didn't get to test them out yet but i followed the exact stept outlined by You, so it should work!). Your tutorial is very comprehensive and practical, very well made and i thank You for it! After porting the first module now i started porting a planet at a time, works great! :D My goal is to port at least a planet a day and see how that works out. 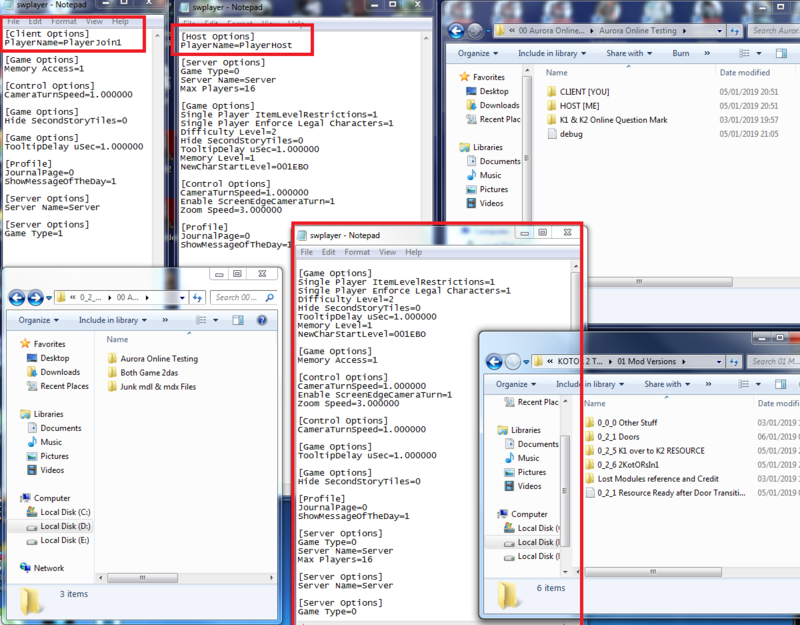 I also managed to batch convert all the model files (.mdl) from K2 to K1, but with some errors. By the way, when You did the batch converting of all the K2 models to K1 (.mdl files to ASCII and then to Binary again), did You get so many errors (about 100 of them or more) when converting the ASCII files back to Binary? I used the correct procedure, and definately didn't forget to set the game to K2 mode when batch converting the Binary files to ASCII and then to K1 mode as I converted the ASCII files back to Binary! I also encountered some errors, less this time (about 40 of them), when first batch converting the K2 Binary files to ASCII... Is this normal? Did You also get so many errors? However a lot of models reported animation errors, duplicate animations and a few other errors, I generally ignored this due to most of them coming from files I was not actually interested in using for the moment. ie : you will get less errors if just converting the maps ie m01aa - m50aa and 000test to 999dia. I still hopefully plan to release a K1 to K2 port if allowed by everybody here that would require users to manually copy files from the first game to the second game, but we will see, alternatively I will just have it as a personal install. I guess you could adress the issue with the K1 to K2 port in a legal friendly way either by creating an easy to follow tutorial that uses your released K1 TO K2 modder's resources so a user would have to gather all your modder's resources you ported from K1 to K2 and manually batch copy them to the override, mods, etc folders to have the full port, either a more advanced method (you would need some programming skills for this), by creating an automated installer that runs on the user's PC and that just rips and converts the files from the genuine installations of K1 and K2. A: Tale of Two Wastelands is a total conversion project that seamlessly merges Fallout 3 and its DLC into Fallout: New Vegas, allowing both games to be played in a single playthrough. It upgrades Fallout 3's mechanics to those of FNV without compromising the feel and balance of the original. New Vegas mechanics like companion wheel, companion perks, weapon mods, crafting, recipes, harvestable plants, and poisons have been added to the DC wasteland items, NPCs, and world. Thought I had broken every lightmap in the game, turned out K2 just isn't showing lightmaps at all for me so I have decided to continue as they should still view fine for everybody else. My confusion reading your posts, now, is some inconsistent history. This may be because English is your 2nd/'n'th language? Specifically, the Aurora engine was not "handed" to anyone. BioWare themselves made it from scratch - those crazy Watamaniuks and their coding skills ❤️ (if you have ever spent any time writing script for these games you have read their code comments, bless them). Also, it was not used in K1 or K2. The Odyssey engine was used; also built by BioWare themselves and a derivative of the Aurora engine (thus many things can still be learned about Odyssey engine from the NWN Lexicon). This may help you, just getting a couple more terms involved. Obsidian then got awarded the sequel contract (TSL) and licensed the Odyssey engine, which they also modified IIRC. English is actually my first language :/ though my grammar is terrible clearly! Thanks for the information on the engine's development, every little helps! English is actually my first language 😕 though my grammar is terrible clearly! Thanks for the information on the engine's development, every little helps! indeed, sometimes little details can help a google search, so you are welcome.